EPB lineman David Everett works to install fiber optic cable along Amnicola Highway in this file photo. NASHVILLE -- Tennessee's most powerful voice for rural interests is weighing in with support for a bill in the state Legislature that frees up Chattanooga's EPB and other municipally owned utilities to offer high-speed Internet outside their service areas. Rose said members in unserved or underserved areas need the ability to send or receive massive documents, video and the like to conduct business. The Farm Bureau's policy statement says the organizations' voting delegates want broadband "in any way possible that they can get it," she said. Last month, acting on petitions from EPB and a Wilson, N.C.-owned utility, the Federal Communications Commission voted 3-2 to override state restrictions that bar the public utilities from offering broadband services outside their service area. 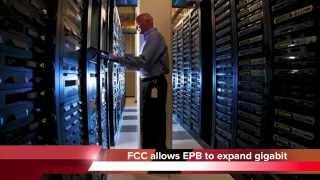 EPB offers gigabit-per-second service, many times faster than standard broadband. Seventeen states besides Tennessee and North Carolina have similar restrictions. But with appeals of the FCC's ruling expected by some states, incumbent service providers and/or other groups, final victory at the federal level could take time or never happen at all. Tennessee Gov. Bill Haslam and his attorney general, Herbert Slatery, both Republicans, have objected to the FCC's ruling and are awaiting its written order before deciding whether to file an appeal. Meanwhile, bill sponsors Sen. Janice Bowling, R-Tullahoma, and Rep. Kevin Brooks, R-Cleveland, said the FCC decision makes it even more critical that lawmakers act. "Tennessee can take care of business for Tennessee," Bowling said. "We don't need the federal regulation so much; we just need the freedom to expand high-speed broadband in small-town Tennessee." Their bill would allow municipally owned power distributors extend their broadband if another public power distributor requests it. Similar efforts in the past have been beaten back by politically powerful interests like Comcast, Time Warner, AT&T and others. Spokesman Daniel Hayes said AT&T is not opposed to municipal broadband networks, but added, "They should be limited to locations where no private-sector broadband service is available and is not likely to be available in a reasonable time frame." He said government money should not be used to compete with the private sector, "which has a proven history of funding, building, operating and upgrading broadband networks," and added that discouraging private investment will "put at risk the world-class broadband infrastructure American consumers deserve and enjoy today." AT&T is a member of the U.S. Telecommunications Association and the conservative American Legislative Exchange Council [ALEC], both of which filed objections to the EPB and Wilson petitions. ALEC's membership includes corporations and state legislators nationwide. Joanne Hovis, CEO of the national Coalition for Local Internet Choice, which supported EPB and Wilson, said the "state-of-the-art for broadband Internet is fiber-to-the-home or business with gigabit." That's what Google Fiber and AT&T "are deploying in Nashville and what many cities, including Chattanooga, have deployed themselves," Hovis said in an email. "Are the other communities in Tennessee entitled to less?" Communities should be allowed to decide service levels for themselves, said Hovis. "No one else should be able to decide what is enough for a local community -- or whether they should be relegated to inferior infrastructure or services." The coalition's board CK's board includes executives with Google, Microsoft and Netflix. Sen. Todd Gardenhire, R-Chattanooga, said he backs Bowling's bill because his top priority is getting high-speed Internet to rural areas of south Bradley County that are in his district. Some 800 families would benefit, he said. He said Charter, Comcast and AT&T told him "it's not profitable" to do it. In Gardenhire's view, "private enterprise has given up on taking care of the people." Some south Bradley Countians are less than a mile from EPB's service area but can't get its broadband, leaving them with dial-up service and a slow connection speed. Joyce Coltrin, whose wholesale nursery is in southern Bradley County, relies on her cellphone to access the Internet. "It's very hard to use an iPhone for business," said Coltrin, who heads a group of 160 households who call themselves "citizens striving to be part of the 21st century." They, too, have been pushing state legislators to change the law. Bowling's bill will go before the Senate Commerce Committee, which has held a hearing but not scheduled a vote. Gardenhire is a member of the committee. So is Sen. Bo Watson, R-Hixson. Watson said he didn't like the FCC's imposition into Tennessee affairs but noted, "I remain open to conversation" with both sides on the Senate bill. His constituents in the Snow Hill area have only limited Internet access, he noted. But the lawmaker said it "gets kind of technical" as to how various sides define broadband service and he's waiting to hear more. He noted that municipal providers like EPB "are still going to go to the places where they can make money and those without will continue to struggle" to get it. EPB, Watson said, "is selling a product, but does everybody's home need that product [gigabit service]? Is there another product that works just as well for your home situation? I still haven't resolved that." Hovis said other options, including wireless and cable modem service, "are important, useful services, but they do not compare to fiber-to-the-home or business." Wireless in particular "is capable of a tiny fraction of what fiber can deliver, with respect to speed, reliability, and capacity," she said. "Because of data caps and usage-based pricing, it's also very, very expensive for anyone who uses a lot of bandwidth, such as families who home-school and therefore require lots of online video." Saying that a community "doesn't need fiber because it has DSL or wireless is like saying that the nation doesn't need the Interstate highway system because we have the Santa Fe trail," Hovis argued. AT&T's Hayes said the company has offered gigabit service to major Nashville businesses for more than 10 years and has plans to roll out its Gigapower to others. Google, meanwhile, plans to build its own network statewide. Justin Owen, with the free-market Beacon Center of Tennessee, a Nashville-based think tank and advocacy group, said the center opposes both the FCC ruling and EPB efforts to expand outside its current footprint. "We've always expressed concern about government entitites competing with the private sector," he said.